For the mission in GTA III, see The Exchange (GTA III). For the mission in GTA Vice City Stories, see The Exchange (GTA VCS). The Exchange at night, as viewed to the north from over neighboring Castle Gardens. The Exchange is a neighborhood in southern Algonquin, Liberty City in Grand Theft Auto IV and Grand Theft Auto: Chinatown Wars. It borders City Hall and Chinatown to the north by Calcium Street, Fishmarket South to the east by Albany Avenue, Barium Street and Union Drive East, Castle Gardens to the south by the South Parkway and Castle Garden City to the west by Union Drive West. The Exchange occupies nearly all built-up areas of lower Algonquin, and serves as Liberty City's historical downtown area. The area is characterized by multiple narrow streets lined with towering skyscrapers, most likely office buildings, a handful of cobblestone roads visible in portions of the city, and few green spaces. In comparison to midtown Algonquin, the Exchange's commercial occupants are presumed to lean towards more conservative corporate organizations and big business, and as a result the district is commonly depicted with pedestrians donning suits and other formal attires. Like much of Algonquin south of Topaz Street, Exchange is intended to lay host to a number of high-class organizations and retail outlets. In gameplay, however, the area boasts only one of two Perseus clothing stores in the city, as well as housing the offices of Goldberg, Ligner & Shyster. A non-interactive Al Dente's restaurant is also based in The Exchange. The Exchange is evidently the in-game equivalent of Manhattan's Financial District in New York City. In comparison to other districts in Algonquin, however, the Exchange's design in detail is less adherent to that of its real-life counterpart. While developers of the game have taken artistic liberties when designing and creating some of the district's buildings, elements of buildings from Manhattan's Financial District may still be visible if inspected in detail. The New York Stock Exchange building. The in-game rendition is, in fact, a solitary structure when the NYSE building is a wall-to-wall building. The facade is also significantly toned down and modeled differently, although the general profile of the game's rendition bears a resemblance to the NYSE building. 17 Battery Place (Whitehall Building). 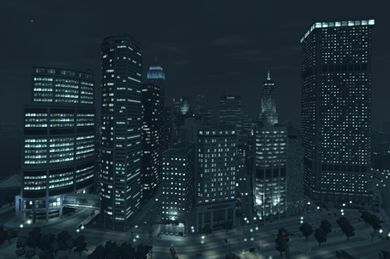 GTA IV's rendition appears to only incorporate the top most facade of Greater Whitehall (the taller building) and repeat the facade for much of the surface of both the game's smaller and larger buildings. In addition, the open archway adjoined to both the original Whitehall Building and Greater Whitehall is included in the game's rendition. 55 Broad Street. The top tier of the building is significantly shorten in the on-game rendition, and shares a similar black marble-clad base as 80 Pine Street, just across the street from 55 Broad Street. 104-124 Broadway (Equitable Building). 69 Exchange, at the northwest border with City Hall and Chinatown, is an adapted reproduction of the building, with similar but toned down setbacks on the facade on three sides of the building facing streets. As a result, 69 Exchange's tower does not follow the Equitable Building's "H" design, but one more like the letter "K". The building is further reused and placed in the eastern edge of Star Junction (with a "Brawls: Liberty City" frontage). 1 New York Plaza , redone as a single tower but otherwise similar in facade design. 17 State Street . In comparison to its real-life inspiration, the game's rendition appears to feature additions on the facade and a less smoother profile. One Wall Street. The GTA IV rendition appears to be similar to the building only by its facade design (as the game's rendition is not a tower, unlike One Wall Street) Even so, the game's rendition has a completely rearranged facade design, but certain features may still be easily indentified, such as vaulted and pointed windows, and limestone walls. Being adjoined to the 77 Water Street look-alike (see below), Tom Goldberg's office at Goldberg, Ligner & Shyster appear to extend into the One Wall Street replica, as evidenced by the position of his office room's windows. 23 Wall Street, which in-game rendition is featured twice in two locations. One, located in the inner areas of the district, is significantly redesigned to fit into a lot where one side is curved. While the real-life building stands on its own, the in-game renditions serve as foundations for taller skyscrapers. 40 Wall Street . The game's rendition shares a similar facade design as part of 40 Wall Street, and is somewhat similar in terms of structural design, with a crowned roof topped with a pinnacle. However, the building's design is somewhat simplified. The design of the upper tower in the game deviates by featuring additional extended layers towards the top, and the roof is shallower than its real-life counterpart. These could be attributed by height issues in game. 77 Water Street. Largely similar to the game's rendition by its facade, but otherwise is different in terms of structural form. The base of the building houses the Goldberg, Ligner & Shyster legal firm. Downtown Athletic Club  (20 West Street (formerly 19)) and the adjoining 21 West Street. The game's rendition of 20 West lacks its majestic Art Deco grand entrance, instead opting for a more generic base design based on 20 West's rear. The base of the building contains an Al Dente's restaurant. The Liberty City Subway has a station, Castle Gardens, along the neighborhood's southern border. The stop is served at all times by the Algonquin Outer Line. Typical cityscape of The Exchange, seen here along Amethyst Street from the eastern end in GTA IV. Exchange's Perseus in GTA IV. Main entrance of Goldberg, Ligner & Shyster in GTA IV. The building in The Exchange in GTA IV that bears a likeness to the New York Stock Exchange building. This page was last modified on 23 August 2012, at 22:19.